Exquisite Writing and a Heart-warming Story! WOW! This book is absolutely beautiful. From the exquisite writing to the heart-warming story, it was everything that I had hoped it would be and so much more. I fell in love with of these characters right away and was so deeply moved by both of their individual stories as well as their combined story. The characters were so well-developed and vibrant. 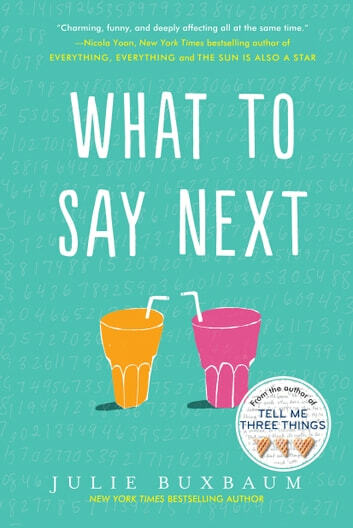 They both had such distinct and powerful voices throughout the story, and Julie Buxbaum utilized their different POVs brilliantly. It felt like the story was continuously moving forward even when you would see snippets of a scene from both perspectives. It was absolutely fascinating to see how David and Kit each internalized and processed the same events in such different ways. While I cannot speak to accuracy of the autism representation, I do believe that one of the major points of this story was to say that you can't just apply that same label to everyone on "the spectrum" and expect it to define them. Julie utilizes a wonderful quote in this book that says, "If you've met one person with autism, you've met one person with autism." I don't think any one person's experience with any mental health condition is going to be the same as any other one person's, and that idea is so wonderfully depicted in this story. David's voice will stay with me for a very, very long time, but Kit was also such an incredible character. She was likable and relatable. My heart absolutely broke for her while simultaneously being filled with hope for her as well. I adore contemporary fiction. It is actually my favorite genre, but I don't typically expect the plot of a contemporary novel to completely take me by surprise like this one did. The plotting of the story and the way Julie wove the different POVs together was truly impressive. This book made me laugh, it made me cry, and it certainly inspired me to want to be a better, more empathetic person. This book should be required reading for all humans. Have you ever loved a book so much that every time you see the cover of it you just sigh happily? Perhaps even swoon? That is my current state with What to Say Next by the very talented Julie Buxbaum. She has a way of hitting a reader right in the feels. I laughed, I cried, I cheered, I felt a wide range of emotions. I had this similar reaction with her previous book Tell Me Three Things (which I also highly recommend). Also, there was a big plot twist that was unexpected and essentially had me locked into the book, racing along until the perfect ending. This was a great book that dives into the tumultuous waters of high school drama and then the riptide of loneliness catches you and makes sure you stay. It made me feel the grief, loneliness, and hope that the main characters, Kit and David, felt. These two were opposites in many ways, yet each of them have their worlds flipped upside down, which brings them together. It is a fresh reminder of the discomfort of finding yourself at the brink of adulthood. It abuses the heart, really, as it is heart-wrenching at times, yet you feel your heart swelling at other times. All in all, a must-read that is different from other YA romance novels in that it presents an exceptional approach of mixing humor with grief to the common struggle of finding yourself. I enjoyed that there were unique attributes about the characters that set them apart from the general population in the book, particularly David's Asperger Syndrome attributes. I cannot say whether or not these features were accurate, however, I do enjoy the respectful and charming way of which his character was developed. I would recommend this for any reader high school age and older who is a fan of innocent romance and deep situations. I would also recommend this book for readers who are fans of math and science as David's narrative is heavy in those fields. On the other hand, it was not so heavy that those who are not strong in the math and science fields (including yours truly) could not follow along. For those who may be offended: there was foul language, brief violence, infidelity, bullying, alcohol use, brief mention of drug use, and an overarching theme of grief. I love Julie Buxbaum's characters. I will miss all of them!